Elvin Tabah focuses his practice primarily in consumer litigation. He has experience both with individual cases and defending class actions. Elvin represents lenders and servicers in mortgage and student loan litigation. Elvin's experience in consumer financial services litigation includes claims under the Fair Credit Reporting Act (FCRA), the Fair Debt Collection Practices Act (FDCPA), the Telephone Consumer Protection Act (TCPA), the Rosenthal Fair Debt Collection Practices Act (Rosenthal Act), the Consumer Credit Reporting Agencies Act (CCRAA), the California Invasion of Privacy Act (CIPA), as well as various state consumer protection laws. Prior to joining Hinshaw in January 2017, Elvin worked for three years as a litigation attorney with a Los Angeles-based firm. 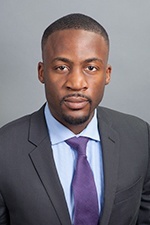 During law school, he served as the academic chair for the Black Law Student Association; was a mentor in the UCLA Law Fellows Outreach Program; and participated in Moot Court. Obtained summary judgment in personal injury action. Second chaired trial that resulted in an 11-1 jury verdict in client's favor. Argued in front of California Court of Appeals and obtained published decision in client's favor on an employment matter. As a former NCAA Track and Field Academic All-American, Elvin enjoys sports and working out. He also enjoys reading, fictional writing, and learning about law.